Hi i am Sekhar Babu, working as Jr. Software Developer,having Couple of years of Experience in Microsoft Technologies like WPF, Asp.Net, XAML, Jquery, Ajax, Sql Server etc. I am from Bhattiprolu, Guntur(Dt),AndhraPradesh,India. 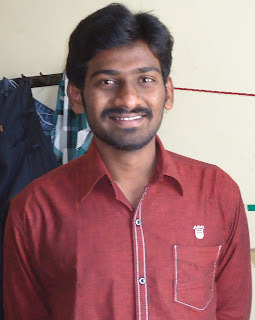 My qualification is B.Tech(Computer Sceince and Engineering) from Qis College of Engineering and Technology, Ongole, AndhraPradesh, India. I post My findings and Practice Example in this technical blog http://aspdotnet-sekhar.blogspot.in as per my knowledge.You can refer Microsoft MSDN site for more correct and accurate Information. You can get tutorials and examples on .Net Technologies from this blog particularly in WPF, Asp.Net and Ajax. The Opinion expressed in this blog are my own not my current or previous Employers. You can find me at sekharbabu.panacya@gmail.com,Google Plus and Facebook Page. Please give me suggestions to improve my blog and my career. Thank You.